Undergoing surgery to transition from male to female isn’t something to take lightly and most people to make the choice have taken the time to think through it thoroughly and carefully. There is a lot involved in the process, including many surgeries and therapies to truly be happy with the completed result. With so much involved, taking one step at a time is the only way to really get through it all. However, there may be alternatives to some parts of the process that will make the transition a little easier. Most gender reassignment surgery (GRS) surgeons want to make sure that your choice to become female is not made on a whim. Most will make sure you are dedicated to this by showing proof of consistent hormone therapy for at least two years before undergoing the surgery. You will also want to do a lot of research when it comes to choosing a GRS surgeon. The best one may not be the closest one to you as there aren’t many GRS surgeons that are experienced and reliable. The travel and accommodation expenses will have to be tallied up and added to the cost of the surgery and hospital expenses. All of this can add up to $30,000 or more. However, if you are truly dedicated to the male to female transition process, you want to make sure you are getting the best GRS surgeon available. 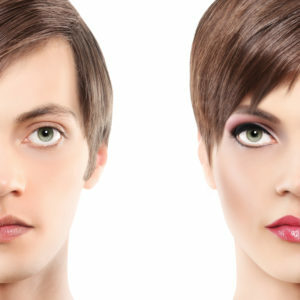 Many males looking to transition to female want a more feminine facial appearance and this may require facial feminization surgery. This is usually not done in just one surgery but in a series of operations that will give you a more feminine look, from higher and more prominent cheekbones, a smaller nose, and fuller lips, among other things that can be agreed upon by your cosmetic surgeon who will make a plan with you as to the things that would help achieve the look you want. Depending on the work to be done, this series of surgeries by an experienced facial feminization surgeon can cost between $40,000 and $60,000, if not more. Breast augmentation surgery involves adding breast implants either under or over the pectoral muscle to create the look of female breasts where there previously were none. If you are undergoing hormone therapy, you may or may not have enlarged breasts. You may want to supplement this natural enlargement with MTF breast augmentation surgery. There is a matter of finding the right male breast augmentation surgeon, making the choice between saline and silicone implants, as well as choosing whether you want them placed under the pectoral muscle or over. There are considerations to be made every step of the way. Taking into consideration everything that one must go through to feel you are happy in your own body, perhaps there are alternatives to some surgeries that will make the process not only cheaper but also easier on yourself? There are alternatives to MTF breast augmentation surgery that can enhance your breast size without the need for surgery. If you are already undergoing hormone therapy, breast enhancement herbs for men can only help to increase the efficacy of those hormones. There are many types of breast enhancement herbs that can help males increase their breast size, just as they help females enhance theirs. Males making the transition to female can benefit from these three herbs as well as many others. Breast enhancement herbs for males can help them to avoid the costs and risks associated with MTF breast augmentation surgery. Males already have natural estrogen in their body, just not very much of it, certainly not as much as a female. Fenugreek helps to stimulate the production of estrogen, so it will naturally increase breast size. Fenugreek helps to increase breast tissue naturally over time. It will also stimulate the production of prolactin. Prolactin is the hormone that increases to produce milk when a woman is pregnant and then breastfeeding. In a male, prolactin will help to enhance breast size. Saw palmetto was used as far back as the time of the Mayan’s to treat women with breast disorders and even breast cancer. It contains phytonutrients that can increase breast size by stimulating the growth of healthy breast tissues in women and it has been confirmed that it can do the same for males making the transition to female. Red Clover is a rich source of the water-soluble chemical called isoflavones which can act similar to estrogen. This can help to increase breast size through the creation of healthy breast tissue. Males transitioning to female may also see additional positive side effects of taking red clover due to the estrogen-like properties of it. Males looking to transition to female taking herbal supplements to enhance their breast size naturally have had some great things to say about the process, avoiding the breast augmentation surgery. These herbal breast enhancement testimonials by men show you just how effective the products can be. Some have reported an increase in size in just 6 short days. Another male has reported that their increase in breast size was noticeable by others, and commented on, in just 2 weeks. After 3 months of using both a soap and capsule natural herb enhancement product, one male is now to the point of increasing a cup size. While a male to female transgender transition process is more involved than just MTF breast augmentation surgery, involving many steps and several surgery types, it is possible to make the process a bit easier. By increasing breast size through natural herbs, you can save on cost as well as reduce the risk and painful recovery process associated with yet another surgery through natural breast enhancing herb supplements. herbal breast enhancement male success stories 2,600 pictures, voice testimonials.